Today’s featured recipe comes from Angela at Untrained Housewife. Angela says she is happy to provide seconds because these cookie dough bars are very healthy and inexpensive too at only 40c a bar! What a great breakfast on the go! The recipe has just five ingredients dark chocolate, dates, peanuts, almonds and peanut butter. I love a mix of healthy ingredients like this. You can snack and know that you are fueling your body properly. 1. In a food processor, chop the chocolate into small bits. Remove from the food processor and set aside. 2. Place the remaining ingredients in the food processor and combine until a paste begins to form. You still want to see tiny pieces of each ingredient. You may need to do this in batches, depending on the capacity of your food processor. 3. If the mixture doesn’t stick together very well, add water one teaspoon at a time until a sticky paste forms. Then add the chocolate back into the food processor and pulse briefly to mix it in. 4. Press the dough into an 8×8 inch pan, cover, and refrigerate for about 2 hours. 5. Cut the mixture into 10 bars and store them in the refrigerator. Thanks for sharing this recipe Angie. And readers, be sure to visit Angie’s Site Untrained Housewife. She has great recipes, DIY projects, gardening ideas, and household tips. It’s a great site! Looking for a breakfast on the go? 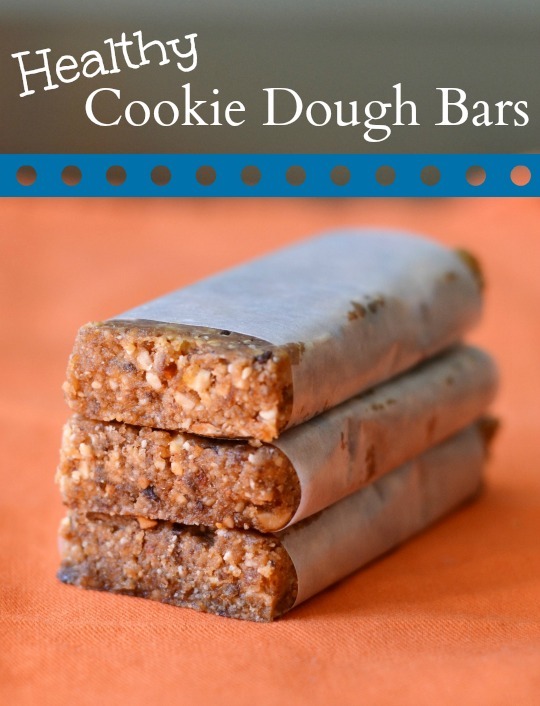 Try these healthy cookie dough bars. In a food processor, chop the chocolate into small bits. Remove from the food processor and set aside. Place the remaining ingredients in the food processor and combine until a paste begins to form. You still want to see tiny pieces of each ingredient. You may need to do this in batches, depending on the capacity of your food processor. If the mixture doesn’t stick together very well, add water one teaspoon at a time until a sticky paste forms. Then add the chocolate back into the food processor and pulse briefly to mix it in. Press the dough into an 8×8 inch pan, cover, and refrigerate for about 2 hours. Cut the mixture into 10 bars and store them in the refrigerator.